Anuradhapura is one of the ancient capitals of Sri Lanka, famous for its well-preserved ruins of ancient Lankan civilization. From the 4th century BC, it was the capital of Sri Lanka until the beginning of the 11th century AD. During this period it remained one of the most stable and durable centers of political power and urban life in South Asia. The ancient city, considered sacred to the Buddhist world, is today surrounded by monasteries covering an area of over sixteen square miles (40 km²). Anuradhapura is also significant in Hindu legend as the fabled capital of the Asura King Ravana in the Ramayana. Arugam Bay is a bay situated on the Indian Ocean in the dry zone of Sri Lanka’s southeast coast. The bay is located 320 km due east of Colombo. It is a popular surfing and tourist destination. Due to its popularity among low budget tourists, the area has managed a slow recovery. By private initiatives only. The main road through town has still not been repaved. Work is in progress to improve road access to the area. But in Arugam Bay itself, little has changed. As late as May, 2009 no help has been received from any official source or international organizations. An exception is uncoordinated support for fishing folk as well as many school rebuilding programs, resulting in a continuation to provide only separatist schools for each community. Adam’s Peak is a 2,243 metres (7,359 ft) tall conical mountain located in central Sri Lanka. It is well-known for the Sri Pada “sacred footprint”, a 1.8 m rock formation near the summit, in Buddhist tradition held to be the footprint of Buddha, in Hindu tradition that of Shiva and in Muslim tradition that of Adam. A Sri Lankan coastal city famous for golden beaches, Bentota is situated on the southern coastal tip of the Galle District of the Southern Province . The town is a popular tourist attraction. It is especially famous among the foreign tourists. The name comes from a mythical story which dates back to kings time saying a demon called Bem ruled this river ( tota = river bank. Bentota hosts a handful of world proclaimed hotels. It is the hosting land for the famous Sri Lankan Jeweler Aida. Bentota also delivers an ancient art of healing called Ayurveda . Bentota is also famous for its production in Toddy. An alcoholic beverage made out of cocunut nectar. The city’s population is estimated to be between 25,000-50,000. Beruwela, is a small resort town in the south western coastal belt of Sri Lanka. The name Beruwela is derived from the Sinhalese word Beruwela (the place where the sail is lowered). It marks the spot for the first Muslim settlement on the island, established by Arab traders around the 8th century AD. A large population of Sri Lankan Moors, many of them are gem merchants, still live in the town– particularly in the “China Fort”. Msjid-ul-Abrar , a landmark of Beruwela and Sri Lanka’s oldest mosque, was built by Arab traders on a rocky peninsula overlooking the town. Located about fifteen kilometers east of Hambantota Bundala National Park is one of Sri Lanka’s foremost destinations for birdwatchers, protecting an important area of coastal wetland famous for its abundant aquatic (and other) birdlife. The park is also home to significant populations of elephants, Marsh & estuarine crocodiles, turtles & other fauna, including the leopard. Stretching along the coast east of Hambantota, Bundala National Park is ideal for instant gratification: in a four hour jeep ride, we can see elephants, 8ft crocs, giant squirrels & flamingoes. Afternoon safaris in the dry season (December – May) provide visitors with the best chance of seeing the wildlife. The name “Colombo”, first introduced by the Portuguese in 1505, is believed to be derived from the classical Sinhalese name Kolon thota, meaning “port on the river Kelani”. It has also been suggested that the name may be derived from the Sinhalese name Kola-amba-thota which means “Harbour with leafy mango trees”. Due to its large harbour and its strategic position along the East-West sea trade routes, Colombo was known to ancient traders 2,000 years ago. However it was only made the capital of the island when Sri Lanka was ceded to the British Empire in 1815, and its status as capital was retained when the nation became independent in 1948. In 1978, when administrative functions were moved to Sri Jayawardenepura Kotte, Colombo was designated as the commercial capital of Sri Lanka. Major attractions of the city include the largest and best preserved cave temple complex of Sri Lanka, and the Rangiri Dambulla International Stadium, famous for being built in just 167 days. The city also boasts to have the largest rose quartz mountain range in South Asia, and the Iron wood forest, or Namal Uyana. Ibbankatuwa prehistoric burial site near Dhambulla cave temple complexes is the latest archaeological site of significant historical importance found in Dambulla, which is located within 3 kilometers of the cave temples providing evidence on presence of indigenous civilisations long before the arrival of Indian influence on the Island nation. Ella is blessed with some of the most beautiful views, you could find in Sri Lanka. Only 8 km from Bandarawela, this small town is used as a base for plenty of trekking expeditions to the surrounding countryside. A taste of the breathtaking scenery of Ella could be had, if you just walk into the Garden of the Grand Ella Motel (Formerly Ella Rest House), where you seem to be standing at the edge of the world, and everything around you seems to disappear at your feet. Another fine view is from the Ambiente Hotel, where the wide doorway, opens out to the mountains, creating a dramatic cinematic like experience, on entry. Some of the places you could see in Ella are the Ella Gap, Ravana Ella Falls, Little Adam’s Peak and Bambaragala Peak among the other many varied pleasant walks with stunning scenery. Galle”Gaul”, and in Sinhalese IPA: [ɡaːlːə]) is a town situated on the southwestern tip of Sri Lanka, 119 km from Colombo. Galle was known as Gimhathiththa before the arrival of the Portuguese in the 16th century, when it was the main port on the island. Galle reached the height of its development in the 18th century, during the Dutch colonial period. The major river is Gin River Gin Ganga which starts from Gongala Kanda and passing villages such as Neluwa, Nagoda, Baddegama, Thelikada, Wakwella and kisses the sea at Ginthota. In Wakwella over the river there is Wakwella Bridge which is the longest bridge in Sri Lanka. Hikkaduwa is a small town on the south coast of Sri Lanka. It is located in the Southern Province, about 20 km north-west of Galle. Hikkaduwa is famous for its beach and corals. Villages affected were Telwatta, Paraliya, Dodanduwa, Kahawa, Rathgama. The place is on the way from Colombo to Galle on the famous Galle road. It is primarily a tourist destination, and serves as a great beach with options to surf, snorkel and enjoy the sun. Horton Plains National Park “Maha-Eliya” in Sinhala, is a national park in the highlands of Sri Lanka. It lies at a height of more than 2,000 m in the central highlands, and its altitude means that it has a much cooler and more windy climate than the lowlands of Sri Lanka, with a mean annual temperature of 16 °C rather than the 26 °C of the coasts. The area was named in 1834 after Lady Anne Horton, wife of Sir Robert Wilmot-Horton, then-governor of Ceylon. Jaffna or Yazhpanam is the capital city of the Northern Province, Sri Lanka. Most of the residents of Jaffna are Sri Lankan Tamils with a presence of Sri Lankan Moors and Portuguese Burghers . Almost all Sri Lankan Muslims were driven off from Jaffna by the LTTE in the 1990s, as a result of the ethnic conflict which started in the 1970s  which leaves Jaffna exclusively Tamil, apart from the military personnel. Kalkudah or Kalkuda (Pronounced Kal-Kuda, Tamil translation rock-bay) is a coastal resort town located about 35 kilometers northwest of Batticaloa, Batticaloa District, Sri Lanka. It used to be a popular tourist destination, however due to 2004 Indian Ocean Tsunami and Sri Lankan Civil War tourist numbers have declined. Pasikudah and Kalkudah are located few kilometers apart. Despite its natural beauty, the western peninsular area of KALPITIYA in the Puttalam district of Sri Lanka is remarkably untouched by tourism. But for those lucky enough to visit, there’s a plethora of things to see and do! With the small close-knit fishing community dominating the lives of the local people, visitors can get a real insight into working life away from the city. After watching the night fishing boats return in the morning, a visit to one of the fish markets offers the opportunity to choose the evening meal direct from the fresh catch! The Dutch Fort and St Peter’s Kerk church in the town itself are interesting examples of Sri Lanka’s rich history and colonial past. Leisurely boat rides up the lagoon and canoe trips down the river are a pleasant way of exploring the coastline, whilst 4WD jeep rides along the deserted sand dunes between the ocean and the lagoon offer a unique way of watching the colourful evening sunsets. Katunayake a town is situated on the west coast of the island of Sri Lanka near Negombo and close to the commercial capital of Colombo. It is the site of Bandaranaike International Airport, the primary international air gateway to Sri Lanka. With the change of government in 1977 and the introduction of the open economy policy a large area was allocated to create a free trade zone. This created a large amount of job opportunities for the local youth and has contributed substantially towards the country’s economy. Kitulgala is a small town in the west of Sri Lanka. It is in the wet zone rainforest, which gets two monsoons each year, and is one of the wettest places in the country. Nevertheless, it comes alive in the first three months of the year, especially in February, the driest month. The Academy Award-winning “The Bridge on the River Kwai” was filmed on the Kelani River near Kitulgala, although nothing remains now except the concrete foundations for the bridge Kitulgala is also a base for white-water rafting, which starts a few kilometres upstream. 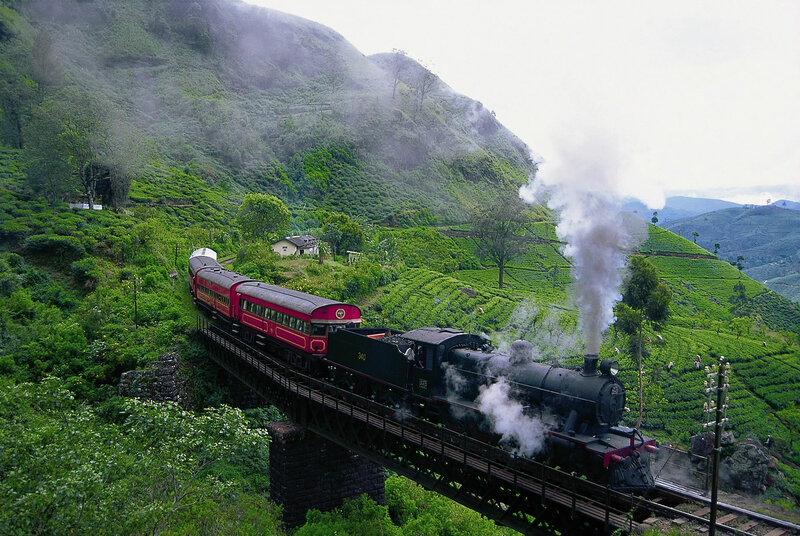 The Knuckles Mountain Range lies in central Sri Lanka, north-east of the city of Kandy. The range takes its name from a series of recumbent folds and peaks in the west of the massif which resemble the knuckles of clenched fist when viewed from certain locations in the Kandy District. Whilst this name was assigned by early British surveyors, the Sinhalese residents have traditionally referred to the area as Dumbara Kanduvetiya meaning mist-laden mountain range (Cooray, 1984). The entire area is characterised by its striking landscapes often robed in thick layers of cloud but in addition to its aesthetic value the range is of great scientific interest. It is a climatic microcosm of the rest of Sri Lanka. Mannar Island is part of Mannar District, Sri Lanka. It is linked to the rest of Sri Lanka by a causeway. 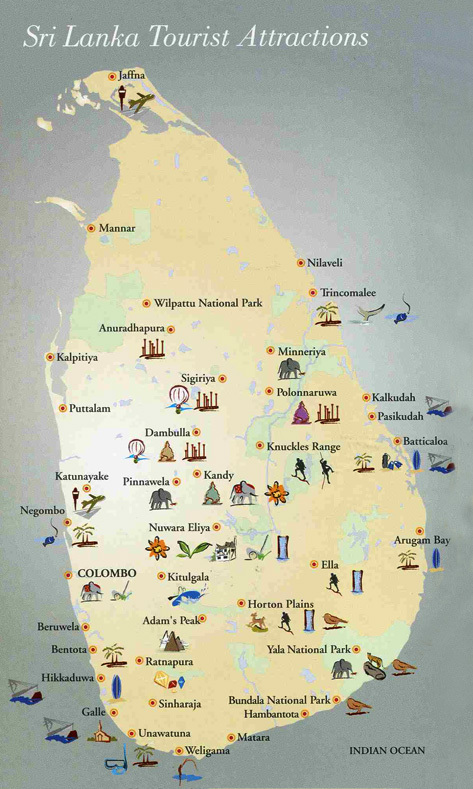 Matara historically belongs to the area called Ruhana, one of the three kingdoms in Sri Lanka (Thun Sinhalaya). First Indians who arrived to the island country according to the Mahawansa settled in the area, along the banks of Nilwala river. Matara was ruled by Sinhala kings for thousands of years and this is evident by the ancient temples and shrines built by them such as temples in Dondra (Devinuwara) and Weherahena. The temple in the middle of the town is also built by ancient kings and now it is a very popular sacred place among the Buddhists in the area. In 16th and 18th centuries Matara was ruled by Portuguese and Dutch respectively. Minneriya is a small town in Sri Lanka, and is famous for two things , for the great Minneriya lake build by King Mahasen and for the Minneriya wildlife sanctuary which is a hot spot for safari lovers because of the abandons of Elephants. Furthermore it is situated near Habarana which have some high class hotels for tourists and some famous world heritage sites like Anuradhapura, Polonnaruwa and Sigiriya which are relatively close to Minneriya. Nuwara Eliya meaning “city on the plain (table land)” or “city of light”, is a town in Sri Lanka. It is located at an altitude of 1,868 m (6,128 ft) in the central highlands and is considered one of the most important locations for Tea production in Sri Lanka. The town is overlooked by Pidurutalagala, the highest mountain in Sri Lanka. Pasikudah or Pasikuda is a coastal resort town located about 35 kilometers northwest of Batticaloa, Batticaloa District, Sri Lanka. It used to be a popular tourist destination, Pasikudah and Kalkudah are located few km apart. The Pinnewela Elephant Orphanage is situated northwest of the town of Kegalle, halfway between the present capital Colombo and the ancient royal residence Kandy in the hills of central Sri Lanka. It was established in 1975 by the Sri Lanka wildlife department in a 25-acre coconut property near the Maha Oya river. The orphanage was originally founded in order to afford care and protection to the many orphaned elephants found in the jungle. As of 2008, there are about 84 elephants. The second most ancient of Sri Lanka’s kingdoms, Polonnaruwa was first declared the capital city by King Vijayabahu I, who defeated the Chola invaders in 1070 CE to reunite the country once more under a local leader. The history of this dry zone district goes back to the arrival of North Indian Prince Vijaya, 2500 years ago in Tammanna in the coastal belt above Puttalam. This happened when his vessel was washed ashore. Thonigala the homeland of Kuweni is deep in the district. The name “Puttalam” may be a modification of in Tamil Uppuththalam , i.e, Uppu means Salt and Thalam means the place where salt production. So finally the name came Puttalam. Ratnapura is the name of the provincial capital of Sabaragamuwa Province of Sri Lanka and the Ratnapura District in which the town is situated. Some say the modern name is derived from the Portuguese name Rapadura for jaggery, the palm candy produced traditionally in this region, but the more common explanation in Sri Lanka is that it comes from the Sinhala “ratna” meaning gems and “pura” meaning city. Ratnapura is also spelled as Rathnapura. Located some 101 km south east of Colombo, it is the centre of a long-established industry of precious stone mining including rubies, sapphires, and other gems. Apart from gem mining, the town is known for rice and fruit cultivations. Sigiriya (Lion’s rock) is an ancient rock fortress and castle/palace ruin situated in the central Matale District of Sri Lanka, surrounded by the remains of an extensive network of gardens, reservoirs, and other structures. It is a popular tourist destination, also known for its ancient paintings (frescos), very similar to those in the Ajanta Caves of India. The Sigiraya was built during the reign of King Kassapa I (AD 477 – 495), and it is one of the seven World Heritage Sites of Sri Lanka. Weligama is a fishing town in Matara district on the southern coast of Sri Lanka. The term Weligama literally means `Sandy Village’ which refers to the area’s sandy sweep bay. Situated at a distance of 143 km from Colombo, Weligama is a popular tourist destination and hosts several boutique hotels. It is most famous for its distinct stilt fishermen and an off shore islet known as Taprobane, where a dream house of French Count de Maunay was built. Wilpattu National Park is a park located on the island of Sri Lanka. The unique feature of this park is the existence of “Willus” (Natural lakes) – Natural, sand-rimmed water basins or depressions that fill with rainwater. Located in the Northwest coast lowland dry zone of Sri Lanka. The park is located 30km west Anuradhapura and located 26 km north of Puttalam (approximately 180 km north of Colombo). The park is 131, 693 hectares and ranges from 0 to 152 meters above sea level. Nearly sixty lakes (Willu) and tanks are found spread throughout Wilpattu. Wilpattu is one of the largest and oldest National Parks in Sri Lanka. Wilpattu is among the top national parks world renowned for its Leopard (Panthera pardus kotiya) population. The Leopard population in Wilpattu is still not yet known. Yala National Park is a national park in Sri Lanka. The reserve covers 979 km², although only the original 141 km² are open to the public. It was established in 1894 as a Game Sanctuary. Much of the reserve is parkland, but it also contains jungle, beaches, freshwater lakes and rivers and scrubland. The latter zone is punctuated with enormous rocky outcrops. The range of habitats give rise to a good range of wildlife.